The videography in this one is not of the best – you can’t see most of my slides because of a combination of camera angle and lighting, which rather damages the effect, and for a good bit of it you can only see me from the nose up, which is quite distracting. This is the one I delivered to an almost empty room for course credit; the Communications Department did video the Oak Awards version, but did not make that edition available to me. For this reason, I’ll present a transcript with the slides inlined, but since vocal delivery is important too, here as well is the video of my second persuasive speech, "Our Friend the Atom". Here’s something we don’t consider normal in the Western world today: the lights going out for no good reason. 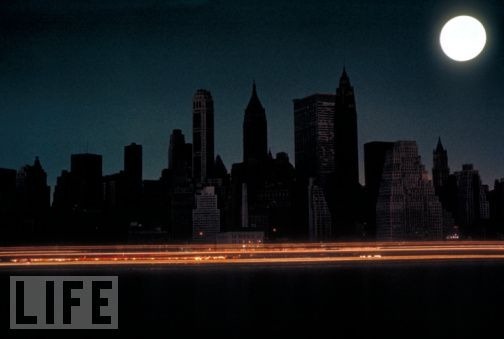 In 1965, a mechanical defect at a power station in Ontario blacked out most of the northeastern United States and Canada, including New York City, for up to 12 hours. They called it the Great Blackout of 1965. A LIFE Magazine photographer immortalized the eerie scene in this photo. Forty years later, Californian authorities were doing it on purpose, in so-called rolling blackouts – not because of technical faults, but due to insufficient generating capacity. Elsewhere in the world, that sort of thing is part of everyday life. But as technology advances, and individual electrical demand trends downward, collective demand always goes up as more and more people get onto the grid. This chart, from the 2010 U.S. Department of Energy International Energy Outlook, shows the projected growth in worldwide generating capacity through 2035. 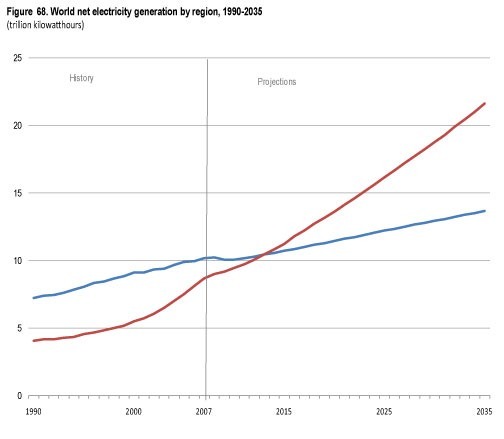 Note particularly the red line, which shows projected growth in the parts of the world that don’t currently have the fully meshed electrical grids that we’re used to here in the First World. Using information gathered from the U.S. Department of Energy and other authorities and historical documents, I’m going to tell you about one thing that I think we need to do in order to head off the potential energy crunch of the coming decades. Obviously we need to increase our generating capacity – by 87 percent in the next 25 years, if you believe the Department of Energy. So how can we do that? Where will it come from? 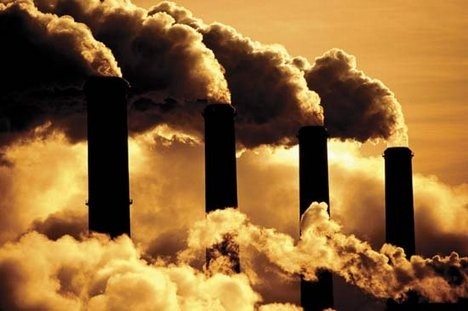 … that will either mean feeding the demon Foreign Oil, or worse, burning more coal, which is messy and harmful. … where the weather is usually like that. Nuclear power was the promise of the future in the 1950s, but it’s gone into a steady decline in the public eye since about 1970. 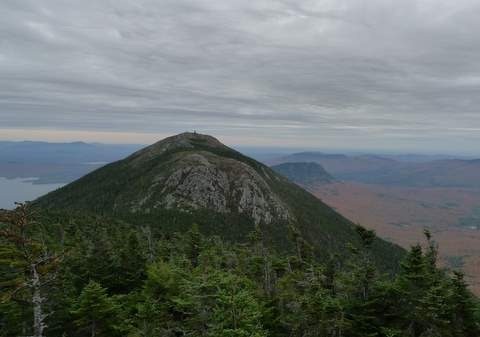 This wasn’t helped by two high-profile accidents, one in the US, the other in the USSR, in the late ’70s and mid-’80s. As described in the American Chemical Society’s Three Mile Island Accident: Diagnosis and Prognosis, Three Miles Island Reactor #2 in Pennsylvania suffered a partial core meltdown in 1979 thanks to a stuck coolant valve. The reactor’s containment vessel and other emergency backup systems did their jobs perfectly. There was no significant radiation release from Three Mile Island, and no one was harmed in the incident. It should’ve been the case study in why nuclear technology works, not the national horror story it became. The 1986 explosion of Reactor #4 at Chernobyl in the Soviet Ukraine… was a horror story. It’s inspired films, video games, and at least one deeply creepy website. This was a disaster perpetrated by Soviet design, Soviet construction, and Soviet operational standards, all of which were, well, Soviet. As John Tabak explains in Nuclear Power, the Soviets designed a type of reactor that lacked an inherent safety factor, built it shoddily, and then decreed that a dangerous experiment should be carried out in the middle of the night by the second-string operators. It’s almost as if they wanted it to blow up. David R. Marples summed it up in Chernobyl and Nuclear Power in the USSR, one of the first books to analyze the accident, when he wrote: "Chernobyl was a badly built edifice, with a demoralized workforce." That was the Soviet system in the 1980s. Things have moved on a bit since then. I believe that with the lessons learned from Three Mile Island, Chernobyl, and other, less famous incidents over the 60-odd years of nuclear history, a new generation of power stations – properly engineered, properly built, properly operated – can provide electricity in abundance, without damming rivers, causing acid rain, or annoying people who live near hills. Of course, nuclear power does have inherent hazards, but there are hazards in any energy technology. Any coal miner or oil rig worker can tell you that. But since when have we, as a species, shied away from using things that are dangerous if mishandled? If that were the case, we’d never have mastered fire or stone tools. This new generation of reactors must be carefully researched, carefully designed, and built to be as safe as they can be, then operated vigilantly and never handled complacently – but they need not be feared. My grandfather was once a member of the U.S. Army rifle team. He taught me to shoot when I was a small boy. One of the first things he taught me was that a firearm must be respected, but never feared. I think it’s the same thing with nuclear power: We need to be vigilant; we can’t be afraid. In my future, this new generation of reactors plays a large role in helping the electric power industry get ahead of the curve – cleanly, safely, and economically. I’m not saying we need to stop research into alternative energy. More choices are always better. I am saying that the atom should play a big part in what we do going forward. The atom is a tricky little so-and-so, but we – you and me, our society, right now – are the smartest, best-educated, most technologically capable human being who have ever lived. We can do this. Here in the defining days of the 21st century, we face a choice. We’re either heading for a brightly lit golden age… or a sputtering slide into darkness. 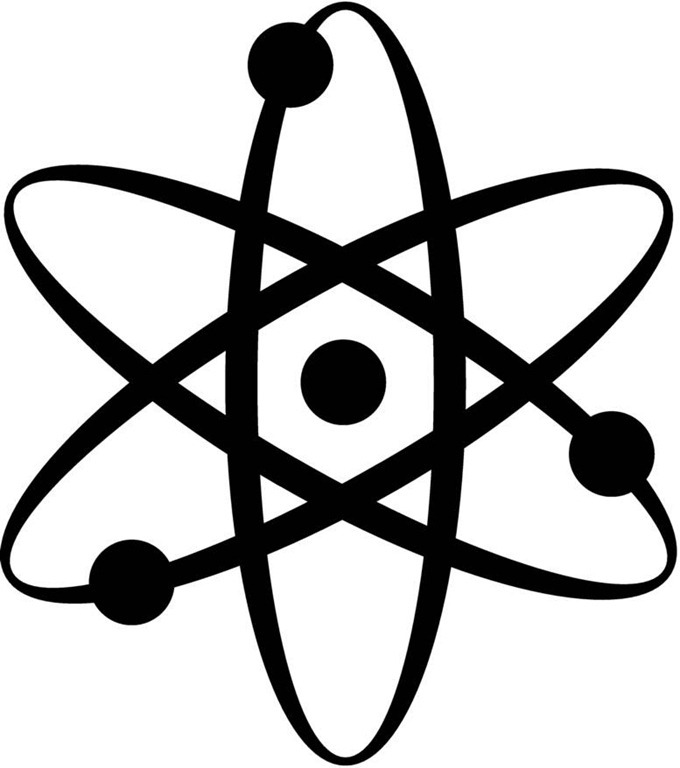 Our friend the atom is a powerful but sadly neglected tool that can, in my view, if grasped with authority and wielded with care, help us achieve the better future that I think we’d all rather have. So let it be known that you support the safe, responsible use of atomic power. Spread the word that the atom is misunderstood, and should be respected, but never hated or feared. 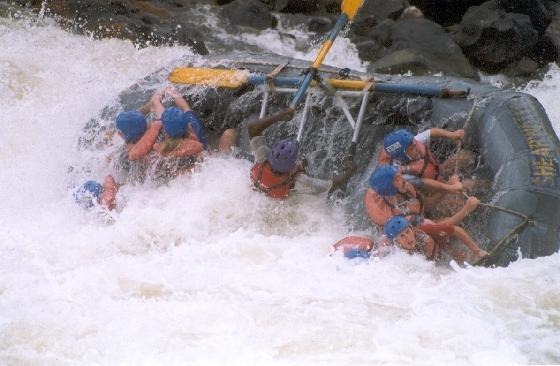 Insist that nothing be done in haste, but that it must be done. Throw off your outdated fears and learn to love the atom – for it will set us free. Thank you. Also, just for the record: No. 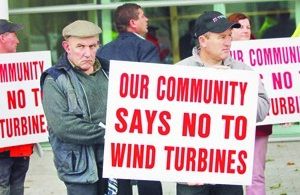 I don’t know what the hobo clown was doing at the wind farm protest in Lincoln either, and the caption they ran with that photo in the BDN made NO MENTION OF HIM WHATSOEVER.